Happy Homemade Sew-along // schedule & the prize! We’re getting sooooo close! This is the last post before the sew-along starts, I promise! Just wanted to let you know what the schedule was going to be for next week and give you a little bit more info about how to participate and what you might win if you do!! So here’s the breakdown for next week . . .
Meg and I are going to be switching back and forth with our posts. I’m going to be covering days 1, 3, and 5 and Meg will be doing days 2 and 4. But don’t worry, it won’t be confusing! Come to either blog each day and we’ll tell you exactly where to find the information you’re looking for! Photograph your finished pull-over and add it to the Flickr group! And, of course, the prize! 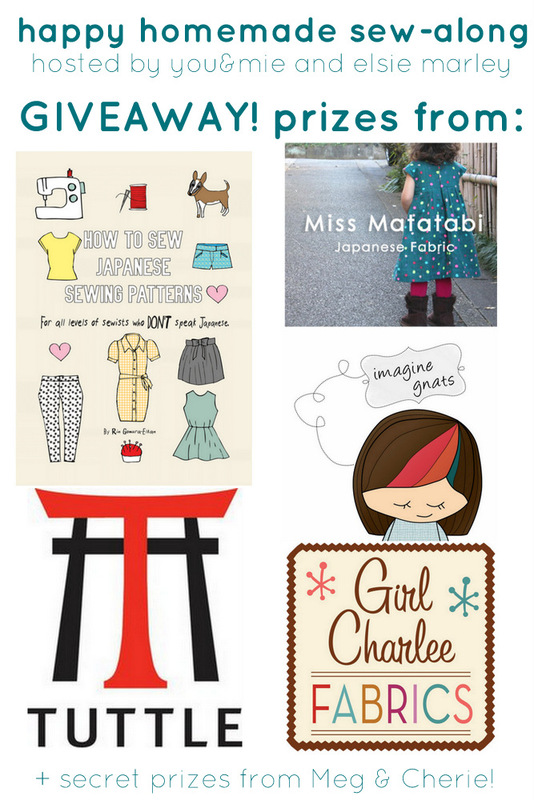 One sew-along participant will be randomly selected from the Flickr pool to win an AWESOME prize package! Secret gifts from Meg and Cherie! RIGHT!?? Ok, I hope you’re pumped! I know some people are still waiting for their books to arrive, others still need to go fabric shopping. You still have a few days to gather your stuff, wash and dry your fabric, and clear your schedule and sewing space! This entry was posted in Happy Homemade Sew-Along and tagged Happy Homemade, happy homemade kids sew-along by Cherie. Bookmark the permalink. Oh Natasha – I’m so sorry!! You’re right, I did say the 30th. Eek! That was on our original schedule, but then we ended up shifting the dates earlier and I forgot to change that one. Darn! I’m so sorry!! !